After months of speculation, Chevrolet has revealed its all-new GT4 contender, the Camaro GT4.R, which is slated to debut next month in both the Pirelli World Challenge and the IMSA Continental Tire SportsCar Challenge. Based on the sixth-generation Chevrolet Camaro ZL1 road car platform, the Pratt & Miller-built car will be homologated to SRO GT4 specifications and be eligible for worldwide competition. 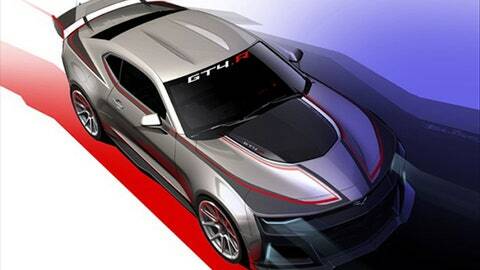 It is the first GT4-spec car to be developed by GM, and to be sold globally. The car is powered by a race-tuned 6.2-liter small-block V8, equipped with a six-speed Xtrac gearbox and paddle shift system. It also features traction control, adjustable ABS, plus race-developed rear wing, front splitter and diveplanes. Both Blackdog Racing and Stevenson Motorsports are expected to be the first customers, with the first car to debut in the PWC season-opener at St. Pete on March 10-12. Stevenson, meanwhile, will give the Camaro GT4.R its IMSA debut one week later at Sebring. Drivers for both programs are expected to be announced shortly.